Last week, I gave you the introductory verses to the Armor of God that we will be studying. If you missed it, you can go back to From Blessed, Into The Battlefield and read it. We are in a battle called spiritual warfare and God’s armor is what we need to stand strong and stay firm in the battle. God is with us and has given us Himself and with God we will be overcomers. Why Is A Suit Armor? Centuries ago, a soldier would put on a suit of armor before heading out into battle. The armor was in place to protect them on the battlefield from their enemies. I would have to imagine these suits of armor were heavy, uncomfortable and hot to wear. Fortunately for us that is not what we are called to wear, a traditional suit of armor. We are called to wear a spiritual suit of armor. We can not begin talking about the belt of truth and the breastplate of righteousness without first talking about faith. Without faith, we would not believe. Without faith, we would not know the truth. Without knowing the truth, we can not put on the belt of truth. This past week, I have heard a powerful story about Mary Magdalene. I also heard a humbling story about the disciples. I was also reminded about my Jesus. The stories I have heard while studying pointed me to faith, believing and truth. Mary Magdalene was healed and freed from her demons then followed Jesus. The disciples followed, was taught and witnessed many miracles by Jesus. Mary Magdalene and the disciples witnessed His death on the cross. Mary Magdalene may have feared that her demons would return because Jesus was dead. His disciples may had questioned all they were taught and had seen because Jesus was dead. Hallelujah it did not end there. Their story did not end with them mislead. No instead, Jesus did rise from the grave. He restored their doubts and fears. He gave them a promise, a prediction. One that is true for us today. He is coming again!! The belt of truth is listed first because truth is what we believe in and know about in our walk of faith. We put the second piece on, the breastplate of righteousness because He made us righteous when we excepted his gift of salvation and believed in Him as our Savior. Unlike traditional armor, that was probably heavy and hard to wear. 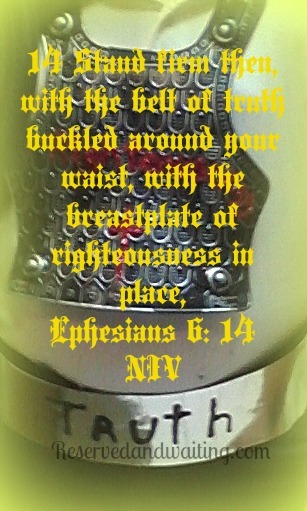 The armor of God is lighter and easier to bear. As followers of Jesus, we have been given a truth in Matthew that we can hold dear to you. Next week, we will be looking at Ephesians 6:15. Until then, may God continue to richly bless your walk in Him. This post is being shared in the Facebook group GROW in His Word, come on over and join us or share your reflection below in the comment area. I used to often pray for my children to put on the armor of God, I have forgotten to pray this lately. Thank you for the important reminder. That is a great idea. I pray so many things over my child never really thought to pray that. Thank you for sharing.